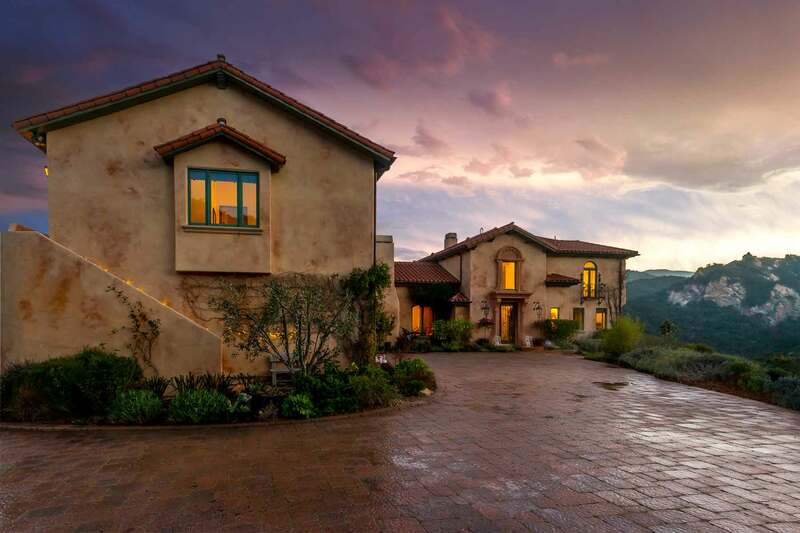 One of the most beautiful custom built private gated Tuscan Villa’s. Incredible attention to detail adorns this spectacular villa prominently sitting on its own private hill and boasting 360 degree post card views. 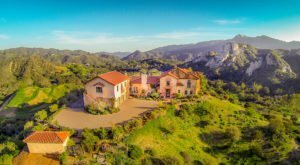 The approximately 10 acre estate is conveniently located to Malibu and Calabasas with riding trails leading to the ocean. The entrance is a fine blend of travertine & imported custom milled 7 inch white oak wood floors, all interior doors were created from Pippy Oak boards imported from England with door panels made from single slices of a 300 year old English oak. The estate has large open spaces and soaring beamed ceilings and incredible built in furniture cabinetry. The large gourmet kitchen features hand made custom cabinets, Sub Zero, and dual Bosch dishwashers with a perfect space to fit a dining farm style table to seat 6. The second story master retreat has a large covered balcony perfect for watching the sunsets and sunrises over the mountains. The master also features walk-in closets and two huge and well appointed spa bathrooms. There is a separate 2 bedroom, 2 bathroom attached guest house with soaring ceilings and large living area. The grounds have a level graded area for horses. There are numerous hiking & nearby horse trails and horse facilities. Another bonus regarding this property is that it falls out of the coastal jurisdiction. Sparking elegant salt water pool & spa, Verizon Fios fiber optics, CAT5; solar system and security.